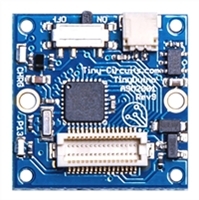 The TinyCircuits TinyDuino is an Arduino compatible board in an ultra compact package. Imagine the possibilities ofhaving the full power of an Arduino Uno in a size less than a quarter! The TinyDuino processor board is roughlyequivalent to the Arduino Uno board same processor, same signals brought out to a shield connector. In fact, mostArduino sketches will work as is without any changes.